Golden Boy Promotions, Inc. is an American boxing and mixed martial arts promotion firm based in Los Angeles, California which was established in 2002 by 10-time world champion (in six divisions) Oscar De La Hoya. "Golden Boy" is one of boxing's most active and high-profile promoters, presenting shows worldwide. In 2005 Golden Boy Enterprises announced the formation of Golden Boy Partners, a company focused on urban development in Latino communities. 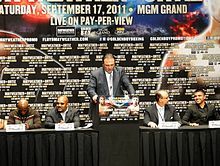 Richard Schaefer making a speech at the press conference for the fight between Victor Ortiz and Floyd Mayweather, Jr.
Golden Boy promoted the May 5, 2007, "super fight" between De La Hoya and Floyd Mayweather at the MGM Grand in Las Vegas, Nevada. Mayweather won the bout by a split decision. The fight once held the record for most pay-per-view buys and once held the record as the second highest grossing fight in the history of the sport. They also co-promoted along with Top Rank, The Dream Match: Oscar De La Hoya Vs Manny Pacquiao on December 6, 2008. In June 2009, Golden Boy Enterprises became embroiled in a dispute over who would fight for the WBA junior welterweight title. On the one hand, undefeated Dmitry Salita (the WBA's No. 1-ranked 140-pounder) was told by the WBA in writing that he will face the winner of the June 27 fight between titleholder Andreas Kotelnik and Amir Khan. On the other hand, Richard Schaefer of Golden Boy said that he had it "in writing" that that fight would face the winner of the Victor Ortíz-Marcos Maidana fight. The WBA's top executives were unavailable for comment. Salita was extremely upset over the prospect that he could lose what would be his first title shot. "They're a big company", he said of Golden Boy. "They're trying to bend the rules. They're trying to kick everyone to the side and get their way, rules or no rules. When Oscar De La Hoya formed Golden Boy, he said he wanted to change boxing, to bring honor to the sport. This isn't the honorable thing to do. This isn't good for boxing. This isn't justice. This goes against the right to pursue happiness, which is why my family immigrated to this country (from Ukraine) and why I've worked so hard. We'll see what happens." Salita ended up fighting Khan, losing by 1st-round TKO. In January 2017, Golden Boy signed a contract to bring their boxing promotions to ESPN under a two-year deal of a total of 48 fights. In October 2018, Canelo Alvarez (50-1-2, 34 KOs), the undisputed king of pay-per-view boxing will usher in a new era in the sport by signing an 11-fight deal with sports streaming site DAZN. The journey begins Saturday, Dec. 15 when Canelo makes his first appearance at the historic Madison Square Garden challenging Rocky Fielding (27-1, 15 KOs) for the WBA Super Middleweight World Championship. This groundbreaking deal with Canelo will be the richest athlete contract in sports history. In 2018, De La Hoya added mixed martial arts matches to his roster, as Golden Boy MMA, beginning with a 2018 trilogy bout between long-time rivals Chuck Liddell and Tito Ortiz. The inaugural event took place on November 24, 2018 in California, and saw Ortiz dispatch Liddell by first-round knockout. When the full card was first announced in October 2018, The Ultimate Fighter 3: Team Ortiz vs. Team Shamrock alum Kendall Grove was scheduled to face Andre Walker. However, this bout failed to materialize. UFC alum Tom Gallicchio was scheduled to face Jason Manly in a Welterweight bout. However, the bout was cancelled when Gallicchio suffered a staph infection. Kenneth Bergh and Jorge Gonzales were announced to fight in a Light Heavyweight bout. However, the bout failed to materialize. Juliana Miller was initially scheduled to face Jasmine Pouncy. However, Pouncy was replaced by Sidney Trillo. In 2008, Golden Boy Promotions and Affliction Clothing started a mixed martial arts (MMA) promotion, aggressively pursuing free agents. The promotion was cancelled 10 days prior to its third Affliction: Trilogy PPV event, featuring Fedor Emelianenko and Josh Barnett, in July 2009, subsequent to Barnett having tested positive for anabolic steroids, in accordance with the California State Athletic Commission, when a qualified replacement fighter could not be secured in time. Golden Boy Promotions: Liddell vs. Ortiz 3 was a MMA event that took place on November 24, 2018 at The Forum in Inglewood, California. For the main event, Chuck Liddell's reported payout was $250,000 (plus a percentage of pay-per-view buys) and Tito Ortiz's payout was $200,000 (plus a percentage of pay-per-view buys). ^ ":: Golden Boy Promotions Inc. ::". ^ Rafael, Dan (2017-01-19). "'Golden Boy Boxing on ESPN' begins partnership in March". ESPN.com. ESPN Inc. Retrieved 2018-05-07. ^ Promotions, Golden Boy. "Canelo Alvarez & Golden Boy Promotions Sign Historic Five-Year Partnership With Global Sports Streaming Leader DAZN". www.prnewswire.com. Retrieved 2018-10-18. ^ "Tito Ortiz gets revenge on Chuck Liddell with vicious knockout in trilogy". MMAjunkie. 2018-11-25. Retrieved 2018-11-25. ^ Straus, Mike (2018-10-15). "Chuck Liddell vs. Tito Ortiz 3 Full Fight Card Announced". lowkickmma.com. ^ a b c d "Liddell vs. Ortiz 3: Results". tapology.com. 2018-11-25. ^ "Exclusive: Ben Rothwell considering offer from new Golden Boy and Affliction fight promotion - Five Ounces of Pain". 19 March 2008. ^ Stupp, Dann (July 22, 2009). "CSAC: Affliction's Josh Barnett tested positive for anabolic steroid, license denied". MMAjunkie.com. Archived from the original on August 20, 2011. Retrieved July 22, 2009. ^ AP "No foe for Emelianenko sinks card", ESPN, July 24, 2009. Retrieved August 20, 2018. ^ Sherdog.com. "Update: Affliction Cancels 'Trilogy'". Sherdog.